The Formentera Council has issued a presidential decree to establish minimum services on the day of the general strike planned for Friday March 8. In preparing the initiative, the administration considered the importance of keeping specific positions staffed to assure public services vital to the community. The following services will be maintained: Centre de Dia—three family workers, one driver, one cook and one disabled services staff; Escoletes—three instructors; OAC (Citizen's Information Office)—three administrative assistants; Works brigade—one brigade leader, two deputy officials and one brigade officer; local police—one administrative assistant; ITV (road worthiness test facility)—one mechanic and one administrative assistance; cleaning services—three staff; Secretaria—one administrative assisant; accounting and payroll—one administrative assistant; fire brigade—four firefighting collaborators. 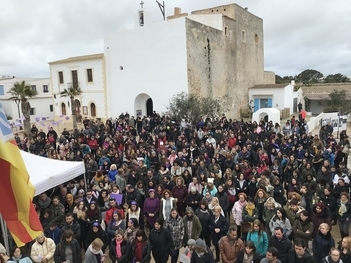 A gathering in Sant Francesc's Constitució square is planned for 12 noon on March 8 as part of the activities programme put together by the local chapter of Espai Dones and supported by the Formentera Council. For those individuals who wish to take part in the demonstration even if they decide not to join the general strike, Council staff other than those on the above list will not be required to be present at their posts from 12 noon to 2.00pm. Female CiF cabinet councillors, who plan to join the feminist strike, have cleared the public agenda on March 8. The councillors will resume office work after attending the Espai Dones-organised events.